Boxing is a proud and noble sport and has been capturing the imagination of the sporting public since the 1800's right up to the present with stars like Manny Pacquiao and it's also a sport that attracts people from all walks of life. CEO of UltraTune Mr Sean Buckley is one of the wealthy businessmen in Australia with close to 300 business outlets around Australia as wells as businesses in Dubai, Saudi Arabia, Abu Dubai and Zambia. 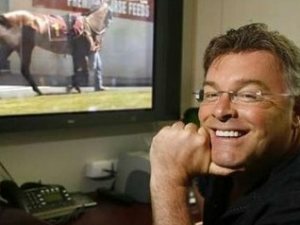 Sean also breeds million dollar race horses with his stud farm and to paint the picture, he is a powerful entrepreneur with great vision and flair. Sean has received many awards and accolades over the years by his humanitarian contribution to many projects and charities he supports. Recently Sean was awarded the WBF Outstanding Service to Australia Boxing due to his support of many boxers and kickboxing at grass roots level in the past 12 years. Enter WBA #2 Randy Petalcorin who recently arrived in Melbourne in February this year for his 2nd visit to Australia in the past 6 months with the aim to defend his PABA Light Flyweight title on March 28th. Sean was interviewed last night on the SEN Radio Ringside boxing show and said "I have many Filipinos who work for me in Dubai and Bahrain and Saudi Arabia and the two boxers they talk to me about is Manny Pacquiao and Randy Petalcorin. They say this kid Randy will be the next superstar boxer coming out of the Philippines. I am helping Randy and other boxers to get them a better life out of the sport of boxing as it is a very tough sport especially at the grassroots level." On Friday night in Melbourne, March 28th at around 9.30pm, Sean Buckley will be glued to to his computer in Bahrain watching Randy fight live via live streaming on internet at www.liveboxing.com.au while on the other side of the world Randy Petalcorin will be entering the boxing ring to defend his WBA #2 world ranking and hopefully secure a WBA world title shot. Sean Buckley has never met Randy but if Randy wins on Friday March 28th at Malvern Town Hall, there will be no happier man in Bahrain then Sean to see Petalcorin come one step closer to fighting for a World title this year and achieve the goal of a better life out of the sport of boxing. 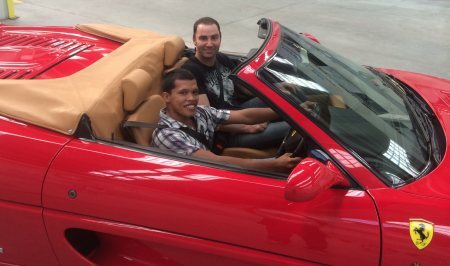 Petalcorin (L) a boxing manager and promoter Peter Maniatis aboard a Ferrari in Australia.